Venus, like Luna, is a bright bulb of curiosity in the Inner System, relegated mostly to the occasional cursory telescopic survey. Patel Energy Corporation has purportedly sent reconnaissance probes toward the Solar System’s second planet. If the mission did take place or if anything of scientific or economic value was found, there is no public data available on it. 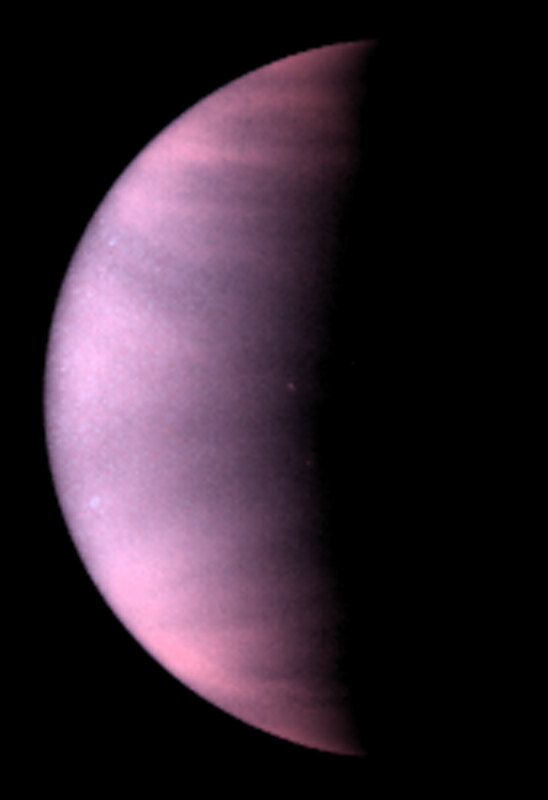 With its crushing atmosphere of carbon dioxide, incredibly high surface temperature, and haze of deadly sulfuric acid, and no natural satellites, Venus has little of human interest to warrant further investigation. There was once some speculative talk about the possibility of settlement in the upper atmosphere, that has milder temperatures, but with the ease of settling on stable worlds such as Titan, this idea was rendered nonsensical for the time being. With the disturbances caused by Terra’s destruction and Luna’s new orbit, it appears that Venus’s orbit was at some point partly destabilized in the last two hundred years, as its average distance from Sol has shrunk by several million kilometers (though still maintains a consistent average distance from the Sun of over a hundred million kilometers as of the year 200). Image credit to L. Esposito (University of Colorado, Boulder), and NASA/ESA, circa March 21 1995, C.E. Captured as an ultraviolet image.